How to teach Common Core standards with my Interactive Whiteboard? Last year, my school district adopted Common Core learning standards. But upon review we found our curricula were somewhat outdated and did not align particularly well with the new Common Core Standards. So, teachers were charged to fill the holes in our curricula with appropriate supplemental materials in order to increase student achievement. We purchased additional resources such as short throw projectors, new interactive whiteboards and iPads, after our community passed a technology levy. Unfortunately, we do not have a large technology department nor do we have curriculum specialists to weed through the best materials and software for us teachers. Many teachers felt overwhelmed at the thought of finding developmentally appropriate, supplemental materials while figuring out how to use all of this new technology at the same time. Essentially, we dove into the deep end of the technology pool with no life vests and one hour of swimming lessons. While reading an education technology blog, “Engaging Tech Tools for 21st Century Learners” by Amy Phillips, I came across an endorsement for Gynzy; “Gynzy is a very cool website with lots of activities for elementary teachers to use with interactive whiteboards, interactive projectors or slates.” On another blog Gynzy was described as ‘a great new website to help teachers use interactive whiteboards, teach common core standards, and increase student engagement’. Furthermore, it was heralded as simple to use. The free 30 day trial was just what I needed to get my feet wet. I began using Gynzy throughout my instructional day right away. I was surprised that it was so easy-to-use and the exercises were completely relevant to what I was teaching. Best of all, the kids LOVED it! At first, I found 10-15 learning activities that I liked to use on Gynzy. I now use about 75 different tools on a regular basis. Still more activities are being developed on a weekly basis, based on teacher’s feedback. I really like I can easily find activities that are aligned with the common core standards I want to teach. 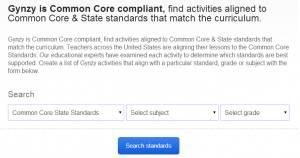 The search tool offers the possibility to easily select the Common Core Standards of your state, the subject and grade you teach. I started telling my teammates and principal about the common core aligned tools within Gynzy, and soon word of Gynzy spread during grade level and vertical teams. Due to the school-wide excitement, we saw a big increase in our teachers’ daily use of interactive whiteboards, so my principal was easily convinced that Gynzy was a tool we needed at our school. Pretty soon tech savvy teachers across my district were asking what kind of magic was happening on the interactive whiteboards at our school. To conclude, Gynzy is the answer to any question regarding inconsistent use of interactive whiteboards. Software programmers and educational experts came together to provide learning activities on a simple presentation platform. Teachers can EASILY find the exact tool that we need when we need it.